Islamists in Minya, Egypt held Muslim prayers inside three destroyed Coptic Churches after they were destroyed this week. Islamists prayed in three Coptic Churches in Minya on Saturday. The Muslims believe that any place in which they pray has to be turned into a mosque. In the ruins of three of the churches the Islamists had attacked and burned in the Minya region in Upper Egypt, the Islamists yesterday gathered and held Muslim prayers. The three churches are that of the Holy Virgin and Anba Abra’am in Dalga. 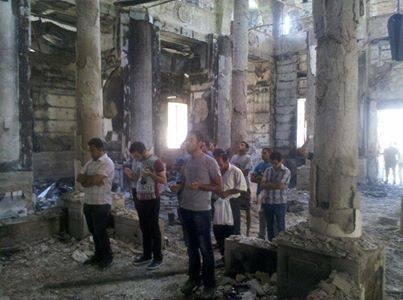 In the ruins of three of the churches the Islamists had attacked and burned in the Minya region in Upper Egypt, the Islamists yesterday gathered and held Muslim prayers. The three churches are that of the Holy Virgin and Anba Abra’am in Dalga, the Evangelical church in Badini, and the church of Anba Moussa al-Aswad in the town of Minya. The action is an attempt to make sure these churches never get built again. The military has pledged to rebuild all the churches the Islamists destroyed. In Muslim tradition, any place in which they pray has to be turned into a mosque or place for Muslim prayers. At least 47 churches and monasteries have been burned, robbed, or attacked since Aug. 14.